Chrysanthus was the son of a Roman senator, born in Egypt. While still young he went with his father to Rome, where his superior intelligence was quickly appreciated. Convinced of the vanity of idol-worship, he undertook every means at his disposition to learn the truth and deliver his soul from the doubts afflicting him. An elderly gentlemen was pointed out to him as a sage, and Chrysanthus went to him with his questions. The old man, who was a Christian, had no difficulty in opening the eyes of the young neophyte; Chrysanthus instantly embraced the truth with ardor and became an apostle. His father, at first astonished, became irritated and decided to bring his son back from what he called his superstitions and errors. No means were effectual for this purpose. Thus, influenced by his associates, the father locked him in his palace and sent a courtesan to seduce his purity. When the first one did not succeed, others were commissioned for the infamous task, and finally a vestal virgin, priestess of an idol regarded as the empire's bulwark, attempted every artifice to corrupt the young Christian. Instead, she herself became the conquest of grace. 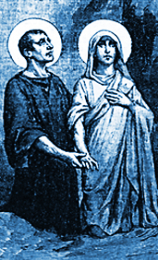 The two Christians saw themselves united by the bonds of faith, hope and charity, and determined to add to these holy chains those of a virginal marriage. This decision brought about liberty for Chrysanthus and gave him the means to continue his preaching of Christ. Many conversions among the officers of the Roman society with which he was already familiar, were the fruit of the apostolate of the young spouses, including that of the tribune Claudius, with his household and seventy soldiers. But complaints began to be addressed to the prefect of Rome, who arrested the young couple. After enduring torments, Chrysanthus was shut up in the Mamertine prison, and Daria was sent to a house of ill fame. But the Lord watched over both of them as He had done over many others, and they surmounted their trials, intact and pure. To be done with them, the irritated emperor had them buried alive. It appears this torment was chosen in order to inflict on Daria the death reserved for unfaithful vestals. The principal relics of Chrysanthus and Daria are in the Abbey of Saint Avold in the diocese of Metz. Have this mind in you which was also in Christ Jesus.